All of the major (read expensive) work has been done. The Engine, a 50hp Pathfinder, has been rebuilt along with the fuel injector pump and injectors. In addition the raw water cooling manifold has been cleaned, new motor mounts, and drive shaft , new alternatorinstalled. 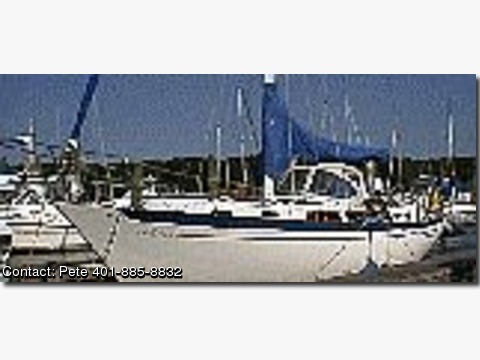 "At Last" is a Center Cockpit sloop, 36 feet on deck, davits and bow pulpit add approx 4 feet, excellent sailing vessel, very comfortable with spacious accommodations, 2 heads one new commode, 2 private sleeping rooms, 1 head each. There is generous space for two to sleep in the salon, new cushions in V berth and stateroom, lots of storage, h&c pressure water, new water heater, new dodger, bimini needs re stitching, autohelm binnacle compass, depthsounder, knotmeter, galley 3 burner stove with oven, refrigeration, Heart Interface link 2000 with ac/dc converter/inverter, new shore power cord roller furled head sail, lazy jacks on on the main, spinnaker crane, sheets and halyard, vhf radio, am/fm radio/cd, 2 anchors, delta and danforth, , recent batteries, new starter. $45.000 no reasonable offer will be refused.